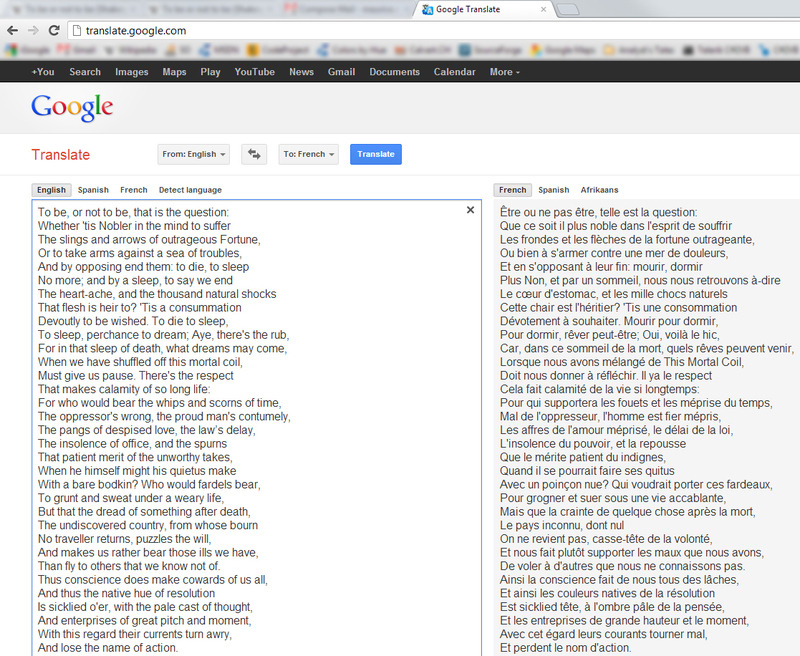 Out of curiousity, I dropped the soliloquy in William Shakespeare‘s play Hamlet into Google translate. Debate about figures of speech in the family at dinner this evening, with the customary arguments about the differences between English and French varieties. it quite made my evening. An aspect of J. K. Rowling‘s genius which many seem to have passed by is the number of children who have (re)started reading. My two sons read on and off during their early years but never so avidly as the Harry Potter series. As of the second volume (the Chamber of Secrets), they squabbled so much that we instated a rule that each child could read only one chapter at a time and then pass the book to his brother. Getting them reading again was great, but perhaps just as importantly their English vocabulary improved immensely (their mother tongue is French), and for this Rowling gets my most sincere admiration. Out of curiosity, we all read some of the books in French; the translation is exquisite, Jean-François Ménard‘s turns of phrase are a joy. Our favourite was “Sorting Hat” rendered as “Choipeau”. Parents and teachers of the world owe a great debt to Rowling.